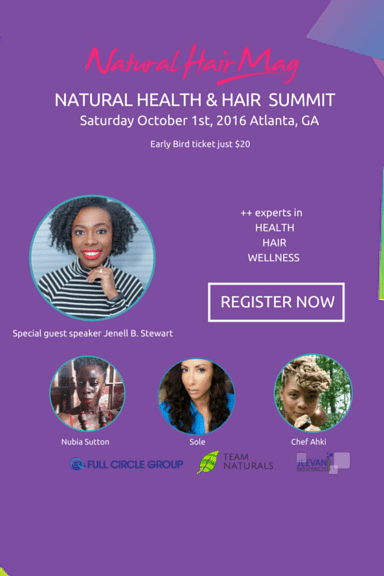 Natural Hair Mag will host the first Natural Health and Hair Summit. The summit will be held in Atlanta, Georgia on Oct 1, 2016. I am excited to be apart of this event. I will be a featured speaker discussing fibroids. I am grateful for the opportunity to speak about this health issue that is plaguing Black women. I battled with fibroids and won. Sharing a journey is necessary to help a community of women. Women are fighting to combat fibroids with herbs and natural alternatives. We want to share our story. Natural hair is a heavy topic of conversation. However, we rarely discuss the importance of self-care. Women at times neglect our health for our hair. You have heard your friends state that they will not exercise because their hair will be messed up. Health is so important to our daily lives. Na-Klectic emphasizes the importance of keeping a health body to have healthy hair. All things are interrelated. It takes time and patience to learn your body. What does your body need for health hair? This event will provide answers to these questions. Natural Hair Mag has decided it is time to open the scope of hair and relate it back to our health. The Natural Hair Summit will change the beauty industry. The focus of health is necessary during a time of diseases and sickness is on the rise. It is pleasure to have health ikons as Queen Afua, Chef Akhi, and Doctah B. America’s leading natural health and hair professional will discuss our favorite topics. Health and hair are related. I am excited that this will be the first event with an emphasis of wellness, natural hair, and nutrition. I have great respect for Natural Hair Mag. I founded Na-Klectic to help people achieve their hair and health goals. The two are related. Health and hair are important. You feel good! You look good! Join us for more powerful discussions concerning achieving healthy hair and a healthy body. The opportunity to discuss health and hair at this powerful event will change the course and awareness of the community. Please visit http://www.nhmsummit.com/.